Mobile Health has been breaking down the barriers of distance for rural New Zealanders for over 16 years now; with our mobile surgical bus providing day surgery at rural hospitals from Kaitaia to Balclutha and Gore; our Rural Health Education Hub providing education, training and workshops to support rural doctors and nurses; and our growing telehealth support service ensuring patients and health professionals alike receive equity of access and ‘face-to-face’ – contracted through the Ministry of Health. “Strong community partnerships are the key to success” says Mobile Health chief executive Mark Eager. “Rather than replace existing services, we act as a catalyst for communities and rural health professionals to develop better health systems”. Our big blue surgical bus has been a frequent sight on New Zealand’s highways since 2002, parking up alongside 24 provincial and community hospitals up and down the country on a busy five-week rotation. So far, we’ve operated on 23,500 rural patients, enabling them to undergo low-risk, elective, day-stay surgery close to their own homes, reducing the inconvenience and stress of a trip to the nearest city and saving on travel-associated public health costs. We employ a core clinical team to help staff the bus, including clinical nurse leaders, anaesthetic technicians and drivers. Once on site, local surgeons and anaesthetists join the bus on a daily basis. Four rural nurses from the host site also join the team each day in the roles of scrub nurse, circulating nurse and recovery and discharge nurses. Rural GPs also come on board, brushing up on skills such as airway management, anatomy and nasal intubation, with some also performing the role of surgical-assist, depending on the speciality. Patients are referred by their local GP to their DHB who place them on the surgical bus operating list, with procedures selected by each DHB according to local need. The most common operations include orthopaedic, gynaecological, general (for example hernia), endoscopy (colonoscopy and gastroscopy), plastic and dental procedures. The surgical bus was designed and manufactured in New Zealand, weighs 42 tonnes and is 4.2 metres high. It is 20 metres in length with a mid-section which extends out to 4.7 metres to accommodate the surgical suite and recovery areas. Rural patients truly appreciate the convenience of receiving treatment closer to home, allowing them to recover closer to family, whānau and support networks. Northland patient Bruce Webb had his hernia operation two months ago when the bus was stationed at Dargaville Hospital. “My experience was absolutely amazing” says Webb. “From the moment I arrived at the hospital, to walking onboard the bus, right through the operation and the after-care, the service was exceptional and thoroughly professional and I couldn’t have asked for more”. Professional isolation can be a significant challenge which is why we place special emphasis on supporting rural health professionals. We delivered 2,509 hours of hands-on clinical training and an additional 4,085 hours of education last year alone with our video education sessions providing support and professional development as far north as Rawene, down to Stewart Island in the south and as far east as the Chathams. Our training includes teaching surgical skills to nurses and doctors on board the mobile bus, as well as advanced skills education for nurses nearing the top of their scope. We have partnered with Christchurch’s ARA Institute to develop the new Level 7 Graduate Certificate in Nursing Practice: Rural Nursing Speciality. Rural Emergency Nursing Care Workshops update practical skills relating to the management of the shocked or septic patient, the sick, child, the disturbed patient and the elderly, confused patient. Mobile Health places special emphasis on helping expose trainee doctors to the rural working environment. Last year, Mark Owen-Cooper began a 4-week elective run on board the mobile surgical bus after completing his Otago Medical School fifth year exams. “I got to assist in pretty much everything, from orthopaedic to hernia operations, laparoscopic gall bladder removals and gynaecological investigations, and spent valuable time learning the basics of anaesthesia, which will benefit me hugely for a future career in emergency medicine” says Mark. 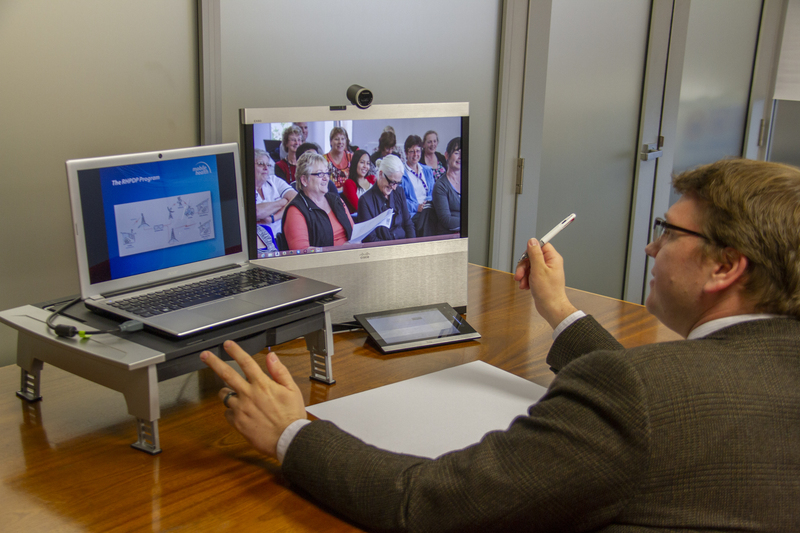 Our growing Telehealth support service helps overcome the barriers of distance for both patients and rural health professionals alike, helping organisations use the latest mobile technology to bring tertiary hospital clinical advice, support and diagnosis right to the rural hospital bedside. 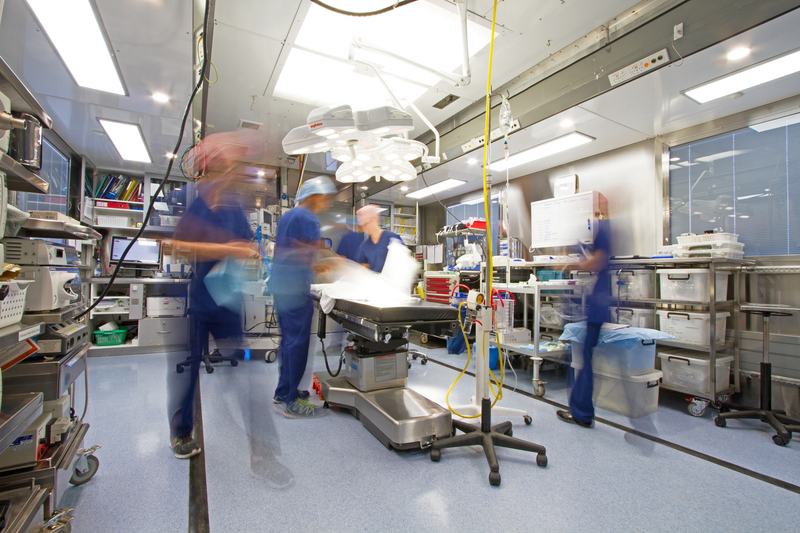 A number of New Zealand hospital emergency departments are now equipped with portable cameras and video equipment for remote support from larger primary hospitals. 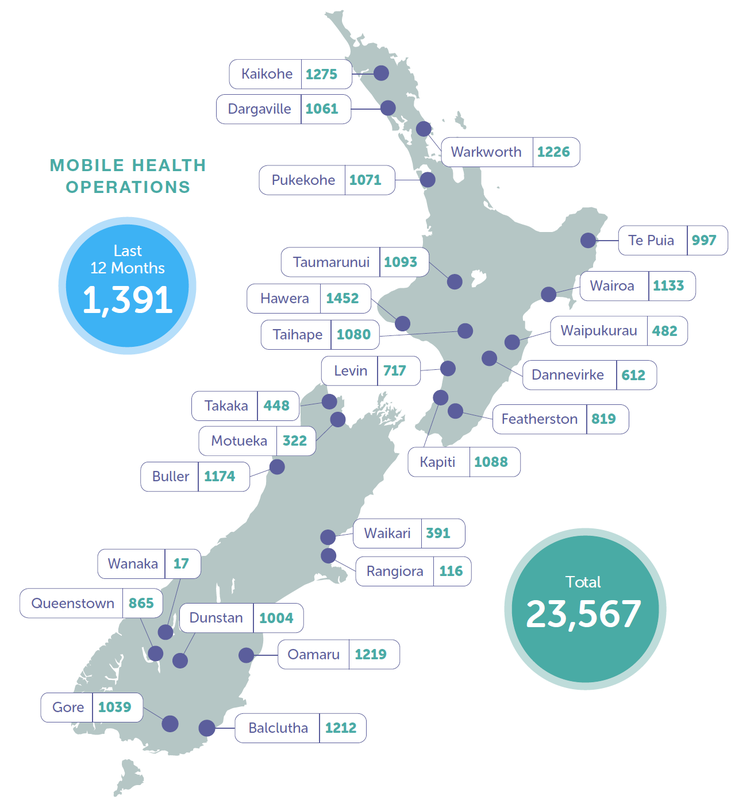 Mobile Health runs the NZ Telehealth Resource Centre and the www.telehealth.org.nz website. Alongside the NZ Telehealth Forum, we provide free and independent support for any healthcare provider wishing to open or expand a telehealth programme. “We are seeing a big increase in the use of Telehealth throughout the country” says Telehealth advisor Andrew Panckhurst. 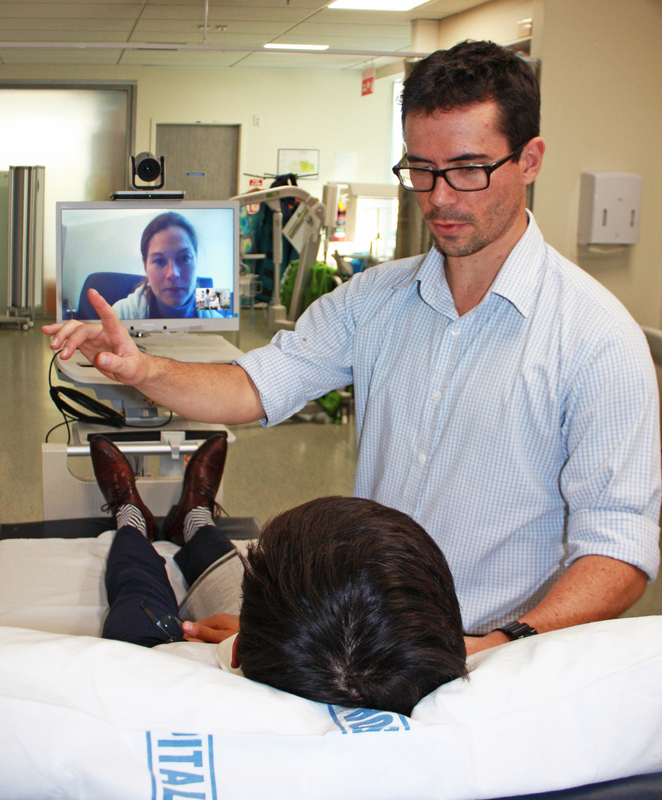 “Clinicians are utilising the technology to significantly improve clinical outcomes for rural patients”. Neurologist Dr Anna Ranta’s pilot Telestroke programme in the Wellington region resulted in a doubling of the rate of stoke thrombylosis treatment from 8-16%. “Equity of access is so important” says Dr Ranta. “If you have a technology like telemedicine, then, in my opinion, there really is no excuse NOT to use it”. Waikato speech language therapist Leisha Davies is now conducting 40% of her patient consultations via video. “Patients love it, especially those with poor mobility, as it allows them the convenience of being able to dial in for a consultation from home or work via their smartphone, tablet or home computer” says Davies.